When it comes to sublimation and selling sublimated goods, one of the best selling sublimated items would most likely be mugs. Sublimated mugs can be a significant source of revenue, but there are some things you need to decide in order to start successfully sublimating mugs. One of the first choices you will need to make is regarding your method of sublimation. When it comes to mugs you have two options. Option one would be a press specifically designed for mugs which is, aptly enough, called a mug press. Option two would be to purchase some mug wraps and sublimate your mugs using an oven. Today, in order to help you make a more informed decision, I wanted to examine some of the pros and cons of each of these options . When you purchase a mug press, you can buy a stand alone version or you can purchase a mug press as part of an all in one press. 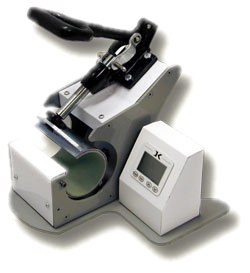 A mug press is designed to sublimate only mugs, and cannot be used for sublimating any other item. Many mug presses are adjustable, which will allow you to do different sizes and shapes of mugs, from your standard 11 oz. coffee mug to a taller, more slender latte mug to a stein. Mugs presses allow the sublimation of one mug at a time, so you will need multiple presses if you intend to do a large quantity of mugs. A mug press is generally a more substantial investment, so if you are just starting out, you may want to take that into account. A mug wrap is a rubbery strap which hooks on the end which is designed to wrap around your mug and hold the transfer in place while the mug is sublimated. The mug wrap is used in conjunction with a common oven, which provides the heat source which causes sublimation to occur. The oven can be your conventional kitchen oven (although it is not recommended that you sublimate with the same oven in which you cook food) or something smaller like a toaster oven. The only requirement for the oven is that it can be heated up to 400 degrees and that it can hold a consistent temperature. Mug wraps are a good option if you plan to do a lot of mugs. Provided your oven is large enough, and heats evenly, you can do 20 or 30 mugs at a time. One thing to keep in mind is that conventional ovens do tend to use more electricity than a heat press, so make sure to factor that in when pricing your mugs. Whichever option you choose, it is also a good idea to make sure you have a digital pyrometer on hand. One of the common problems with sublimating any item, including mugs, is hot or cool spots in your press or oven. A digital pyrometer can help you find those problem areas, and thus avoid having your mugs come out less than perfect.